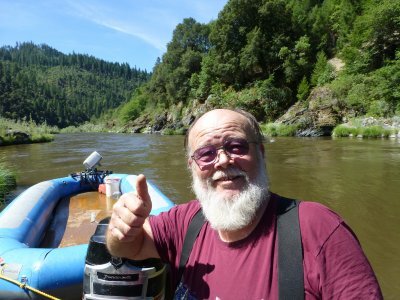 This has really been a good season for us along the Klamath River in northern California. 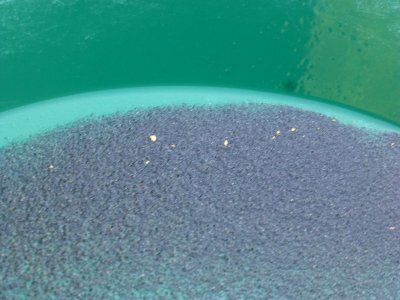 While we have members scattered all over our extensive properties actively prospecting and mining, we have been doing our Weekend Group Mining Projects on an extensive virgin gold deposit that was discovered late last season on one of our newer properties, K23AA, about 7 miles downstream of Happy Camp. K-23AA is an extensive mining property that reaches down and nearly touches our Wingate Claim (K-23A). Wingate is another popular and very large property that includes a US Forest Service river access (boat ramp into the river) and a rather extensive free camping area which includes toilet facilities. We devoted all of last season’s Group Mining Projects to another high-banking area located up towards the upper end of K-23AA. 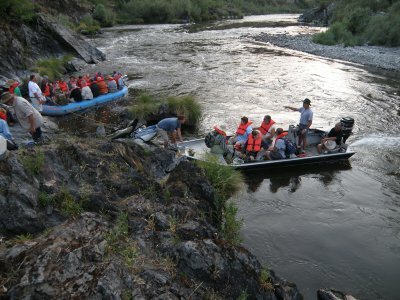 Since that gold-rich discovery was on the far side of the river from Highway 96, we pulled one of our very large Colorado River Rafts out of storage and used it to transport project participants directly across the river to the worksite. A small outboard motor mounted on the raft made those boat transfers rather easy. 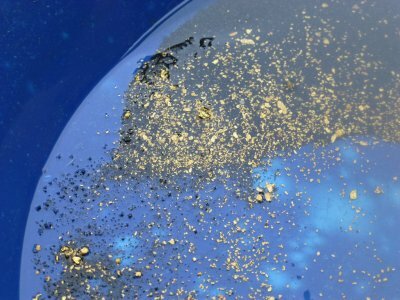 But this new much larger gold discovery about a mile downstream on K-23AA is a whole different story. It is located in a more remote reach of the river. While there is a good trail from the nearest easy boat crossing, we know there would be some project participants that would not be prepared to make the hike back and forth two days in a row. 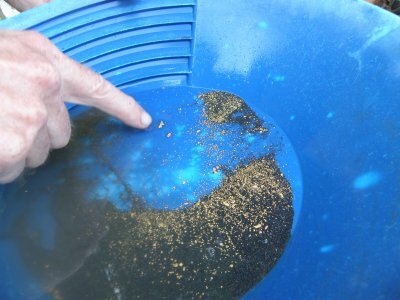 This is one of only two virgin gold deposits we have found up out of the water during the past 30 years! The gold deposit is quite rich; so there has never been any doubt that we are going to work it. The challenge has been in coming up with ways to deliver large numbers of participants to and from the worksite with the use of boats. Ultimately, through trial and error, we worked out a way to use my jet boat to tow the river raft, which was also making use of its own, smaller outboard engine. Participants parked their vehicles down at our Wingate property and then were carpooled about a mile upriver where they boarded the boats. Then we towed them about a half-mile downstream to the worksite through a pretty aggressive set of rapids. Then later in the day, we used the same boats to tow them about another half-mile downstream through another set of rapids to Wingate where they could offload near to where their cars were parked. This is all something we have never attempted before with large numbers of people. 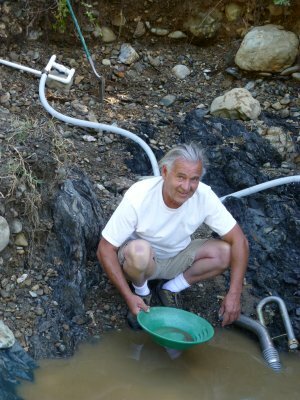 But we knew at the beginning of the season that the new gold discovery is so rich, we had no alternative but to give it a try. 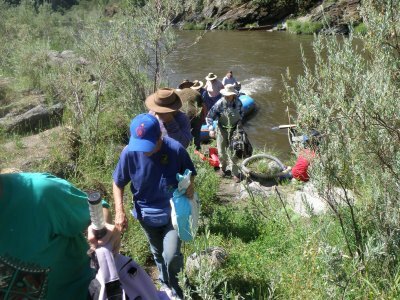 As it turns out, towing large groups of people downstream is the easy part. Not to mention that the boat adventures through the deep, remote canyon adds a white water rafting dimension to the already-exciting program of recovering your own gold. Our free Group Mining Projects provide the first mining experiences for many of our members. These Projects are one of the many exciting benefits of being a member of The New 49’ers. The main challenge of using the boats has been in towing the large rubber raft back upstream through the rapids so that we can pick up more passengers. Even with twenty passengers at a time, it has been taking 4 to 5 trips each time we move the participants. During our first attempts, we were mostly flooding the raft with water from standing waves in the rapids that would wash right over the front and swamp the raft. We finally worked it out with my jet boat on the first project; but repeated trips upstream put so much wear and tear on my jet boat that we almost didn’t make it up the rapids for the final two voyages. That would have left about 40 participants stranded on the far side of the river – which would have been rather embarrassing. Here is just a glimpse of how extensive this deposit is! 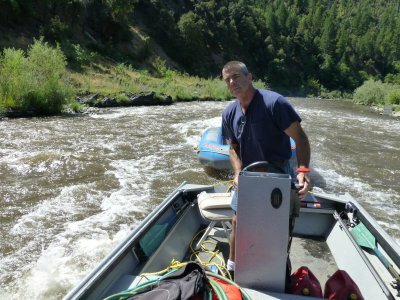 One of our newer members, Dan Baker, arrived this summer with one of the best jet boats I have ever seen for maneuvering the Klamath River. His boat has about twice as much power as mine. Dan volunteered his boat during our second Group Project to tow the raft back up through the rapids. Making this happen also required some trial and error, because the Klamath River had dropped due to the ongoing drought. While you would think that less water would make the river run slower, it actually makes the rapids steeper and faster. Last month’s newsletter shares some of the fun we had while trying to work that out – which we ultimately accomplished. But Dan needed to attend to some family business, so his boat was not available for this most recent project. Fortunately, several days before, Siskiyou County was slammed with a cloud burst of rain – which brought the river level back up a little and turned it brown. You will see the darker-colored water in some of these images and video sequences. Even still, we were pretty sure that my jet boat was not going to handle the load. So a bunch of our loyal Project helpers and I were down on K-23AA a few days before this project with it in mind that we were going to need to transport all of our project mining equipment upstream to a point closer to the river access. That was going to be a lot of work! It also was going to require us to make a whole new gold discovery further upstream. We were pretty confident about making that happen; but it is very painful to withdraw from an already-established rich gold deposit! With a good crew, you can do anything! We had 85+ enthusiastic participants signed up for this project. That’s an all-time record for the third project of the season. We sure have a lot of interest this summer; there are plenty of new faces around! Saturday morning is always devoted to some classroom theory and organization. We do this over at the Happy Camp Grange Hall. After lunch, we all parked our vehicles down on the Wingate property. Two car pools had already been organized to immediately transfer people a mile upriver where the boats were waiting. It took four trips to get everyone down to the worksite. 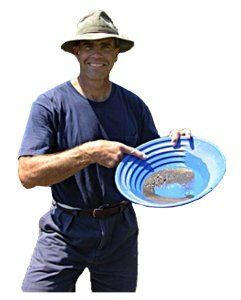 A dozen or so of our most experienced members were already set up at the site to teach beginners how to gold pan. Teaching people how to pan is really the main objective on Saturday. 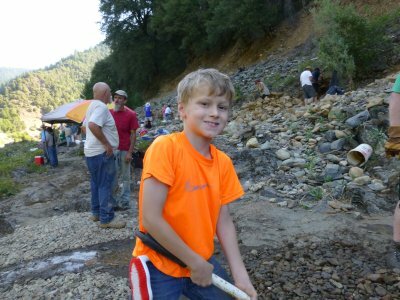 Gold panning is the essential beginning of the prospecting learning curve. 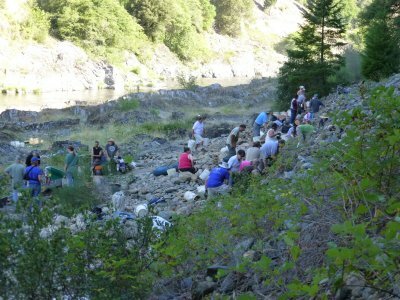 Participants get to keep all the gold they find on Saturday; so there was no holding back this enthusiastic bunch of prospectors. 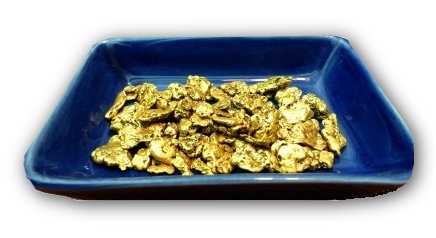 I saw several nice gold nuggets recovered off the bedrock. People were pretty jacked up even though it must have been 100 degrees out in the sun. We normally don’t keep people out there very long on Saturday afternoon. This is because we want them at their best on early Sunday morning when we pull together to recover as much gold as we can in several hours of hard work. 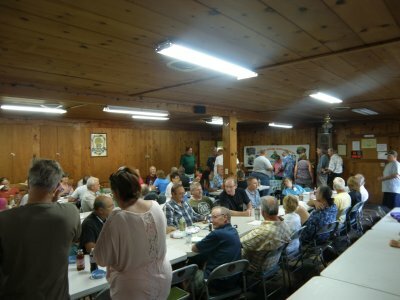 Saturday night potluck was a full house, as usual. There was lots and lots of great food to go around. The roar of exciting chatter was like something you would experience at a sporting event. After a short meeting, we sent everyone home early. 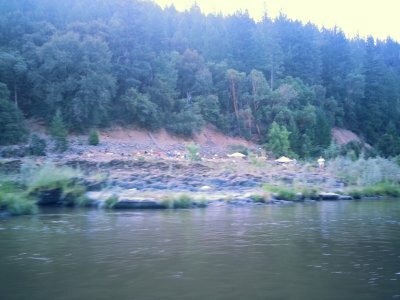 Running the river with twenty passengers! Craig Colt showing off some mid-day gold. These projects are so much fun! Both John’s and Craig’s sample pans were showing good results! After a final, exciting boat trip down to Wingate, we all agreed to meet back up at the Grange Hall in Happy Camp at 2 pm to finish the cleanup and split the gold. This involves several steps in which participants are able to watch and help. 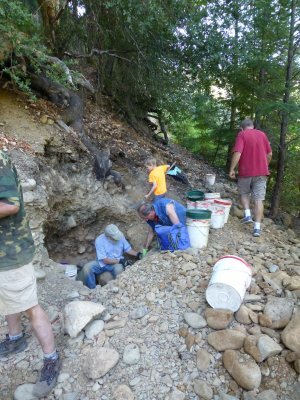 As far as I am aware, our Weekend Group Projects are the only program in America, perhaps in the world, where we demonstrate and allow people to actively participate in a successful gold mining program from A-to-Z, from sampling, to discovery, to production, to cleanup – and actually receive an equal share of the gold. 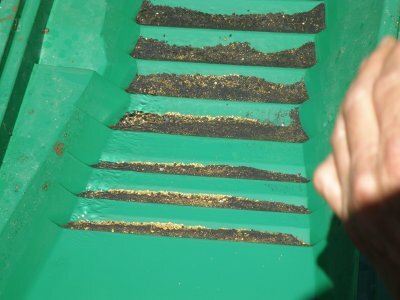 In all, we recovered exactly three-quarters of an ounce of beautiful virgin gold. There were 16 gold nuggets. This was all split between 71 very happy participants who stuck with us until the very end. 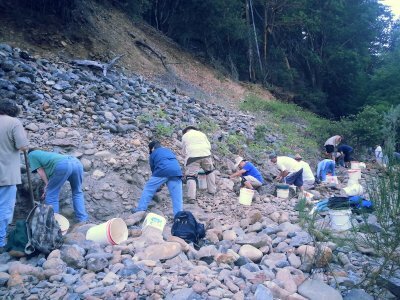 Join us for our remaining Weekend Group Mining Projects this Season! Remaining schedule of 2015 Events: August 8 & 9; and August 29 & 30. Let’s Not Rule out the Last Part of our 2015 Dredging Season Just Yet! We have switched gears into appealing San Bernardino’s recent Ruling to deny any meaningful relief to suction dredgers even after the court has Ruled and Ordered that California’s suction dredge moratorium is unconstitutional — which State authorities continue to enforce (by seizing dredging equipment they find on the river). As you may recall, our initial Motion for a Statewide Injunction to prohibit California from enforcing the unconstitutional moratorium and return us to the earlier set of regulations that were legal was recently denied by the Superior Court of San Bernardino. We believe that Ruling was flawed, and have filed an appeal with California’s Forth Appellate Court to get our motion approved. There is a legal provision in California which requires appeals of denied injunctions to be expedited when ongoing circumstances are causing irreparable harm to people who are 70 years or older. A bunch of our 70+ year old members have come forward with Declarations in support of this appeal. You can find the Appeal, along with supporting Declarations, at the bottom of this page. Our Appeal with the Forth Appellate Court is being filed as we go to press with this newsletter. You can watch for links to the material either on our Internet Forum, or on the legal page we have specifically set up on our web site to keep you guys informed. Let’s not give up yet on 2015!